Experience the Lake District and England with A Good Guide! Val Abraham will take you to places you may never find alone. Although based in rural isolation within the boundaries of the Lake District National Park, Cumbria, Val is within easy reach of many of Britain’s cities and transport hubs. 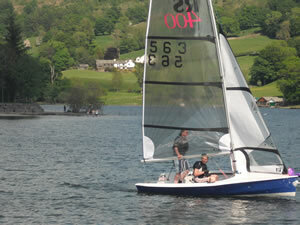 Val will clarify the preeminent places to visit in Great Britain and present you the finest routes. The physical beauty, abundance of fauna, striking flora and native wildlife of Britain create a stunning destination. Cumbria and the Lake District in the North West of England is a top destination. The region provides tranquility, beauty, mighty mountains, lakes, rivers, waterfalls and a dramatic shoreline. Road Links - Use the M6 Motorway from England’s Midlands to Scotland. The road passes through the County of Cumbria and the Eastern edge of the Lake District National Park. Rail Links - Use the Western Main Line from London to Glasgow and Edinburgh. It stops in Cumbria at Oxenholme (for Kendal and Windermere), Penrith and Carlisle. Other prominent Railway Lines traverse from the East to West Coast of England including the picturesque Settle to Carlisle Railway Line. Air Links - The County of Cumbria can be reached by many of the UK’s International Airports including Newcastle, Liverpool, Blackpool, Leeds Bradford, Manchester, Glasgow and Edinburgh. Just home from lovely England with so many good memories. Margaret and I both agree our time in The Lake District was the highlight of our two weeks. Of course you were the reason for that. We (your group) felt privileged and fortunate to have reaped the benefits of your enthusiasm. I’m still in awe of the knowledge you so cleverly passed on to us and only hope I can retain a few snippets. You are a captivating, vivacious and entertaining guide who so obviously enjoys her job. Thank you for a delightful experience. Sandy Hansen - Hayden, Idaho U.S.A.